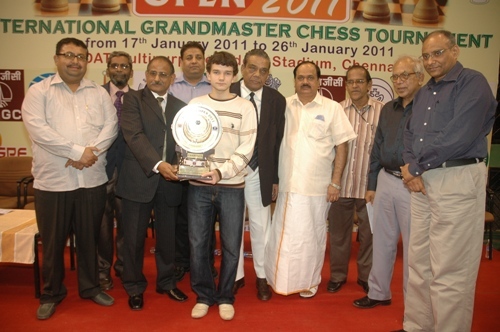 20-year-old Ukraine Grandmaster Kravtsiv Martyn emerged the champion of India Cements Ltd 3rd Chennai Open International Grandmaster Chess tournament with a hard fought final round victory over Israel Grandmaster Alon Greenfeld at SDAT Multipurpose Indoor Stadium, Chennai. Grandmaster Kravtsiv Martyn secured 9.5 points from eleven rounds, and was followed by Tamir Nabaty, Ni Hua, Alexander Areshchenko and Baskaran Adhiban. Martyn took home the winner’s prize of Rs. 200000 (Rupees two lakhs only), while the shared second place quartet were awarded Rs.93500 (Rupees ninty three thousand five hundred only) each. Earlier, the fight for the top prizes went off in a quiet manner, as the top board game between Tamir Nabaty and top seed Alexander Areshchenko ended in an early draw. With the peace being signed in the top board, the young and energetic Ukraine Grandmaster Kravtsiv Martyn took up the challenge in the right earnest and brought down the Israeli Grandmaster Alon Greenfeld. The Sicilian game lasted 60 moves and was one of the last to conclude in the event. Martyn emerged a clear winner, ahead of his countryman and top seed Alexander Areshchenko. 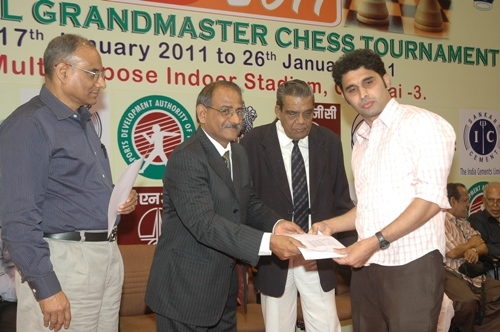 GM Kravtsiv Martyn (Ukraine) receiving the Chennai Open 2011 trophy from Chief Guest Mr.V M Mohan, Joint President, Corporate Finance, India Cements Ltd. (L to R) Shri R M Dongre, President, Asian Zone 3.7, Shri K Muralimohan, Hon Secy, Tamil Nadu State Chess Association, Shri Bharat Singh Chauhan, President, Commonwealth Chess Association, Shri S Ganesan, Chairman, Organising Committee, Shri J C D Prabhakaran, Vice President, Tamil Nadu State Chess Association, India’s first International Arbiter V Kameswaran, International Master & Government observer for chess Shri Manuel Aaron, Shri D V Sundar, Hon Secy, All India Chess Federation. In addition to Grandmaster Baskaran Adhiban who logged in 9.0 points taking the shared second spot, International Masters Sahaj Grover and Saptarshi Roy Chowdhury finished in top ten taking the shared 6-9 places scoring 8.5 points, giving India three spots in the top ten placings. A total of eight International Norms were achieved in this tournament, with one Grandmaster Norm, six International Master Norms and lone Woman International Master Norm completing the tally. 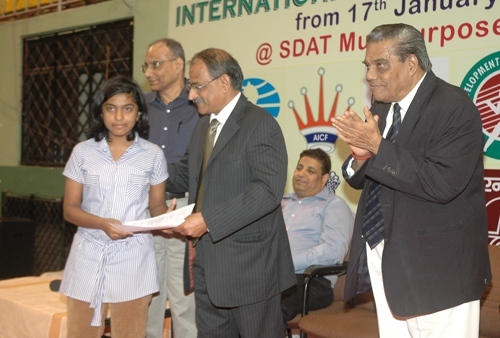 This annual feature has put Chennai securely on the world chess map, thanks to its growing popularity every year. 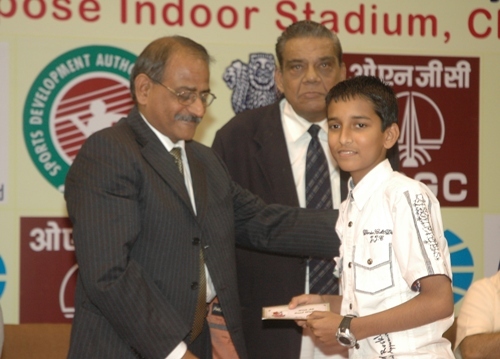 The cash prizes for the top 35 spots along with age category prizes were distributed by Mr. Shri V M Mohan, Joint President, Corporate Finance, India Cements Ltd, in the presence of Shri S Ganesan, Chairman, Organising Committee, Shri D V Sundar, Hon Secy, All India Chess Federation, International Master & Government observer for chess Shri Manuel Aaron, Shri J C D Prabhakaran, Vice President, Tamil Nadu State Chess Association, Shri Bharat Singh Chauhan, President, Commonwealth Chess Association, Shri R M Dongre, President, Asian Zone 3.7 and India’s first International Arbiter V Kameswaran. Shri K Muralimohan, Hon Secy, Tamil Nadu State Chess Association proposed the vote of thanks. News and photos by R R Vasudevan.